Through different instruments, the United Nations and its Member States have acknowledged the gendered impacts of armed violence and the importance of including women in disarmament negotiations and peacebuilding programmes. With the establishment of the Women, Peace and Security agenda (2000), as well as the adoption of the 2030 Agenda for Sustainable Development (2015), gender goals, perspectives and concerns are more consistently and comprehensively included in national policies multilateral resolutions and international agreements. The disarmament field has begun to also address gender concerns. The issue is regularly raised in policy debates in various multilateral forums, such as the UN General Assembly's First Committee, which has approved resolutions on the topic of “women, disarmament, non-proliferation and arms control”. This notwithstanding, it has proven challenging to encourage disarmament processes to incorporate gender responsive approaches into policies and mechanisms and to concretize the differentiated security needs of men and women, girls and boys. The IGC Disarmament Impact Group seeks to support the disarmament community in translating gender awareness into practical action across the range of multilateral disarmament processes and activities. In its first action in the new year, and after being nominated for the prestigious Arms Control Person(s) of the Year 2018 for its work on disarmament and gender, the IGC Disarmament Impact Group published a Resource Pack for Multilateral Practitioners on Gender & Disarmament. The Gender & Disarmament Resource Pack includes basic information on gender equality and its relevance to arms control, non-proliferation and disarmament, in addition to practical ideas that can support diplomats in applying a gender lens to their work. 1. Why gender and disarmament? Key concepts and main approaches for integrating gender perspectives into arms control, non-proliferation and disarmament. 2. Progress to date: How gender perspectives have been applied to relevant arms control, non-proliferation and disarmament agreements and United Nations General Assembly resolutions. 3. Areas for action: Practical guidance on how to make multilateral meetings more inclusive and gender-responsive leaning heavily on the IGC Gender-Responsive Toolkit published by the IGC Representation Impact Group launched on the sidelines of the UN General Assembly in September 2018. 4. Further resources: In addition to a non-exhaustive list of statements, working papers and studies addressing gender perspectives in arms control, non-proliferation and disarmament. Also in early 2019, the International Gender Champions Disarmament Impact Group created a factsheet on the Arms Trade Treaty (ATT) and Gender Equality. The factsheet provides data on small arms and gender-based violence and proposes actions States Parties can take to address these issues including within the context of the ATT. The factsheet was prepared by the International Gender Champions Disarmament Impact Group (DIG) in collaboration and Control Arms. 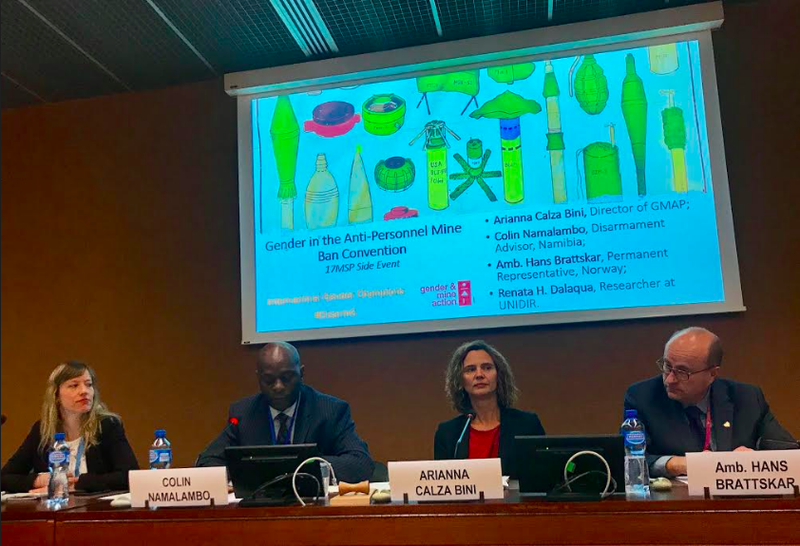 The International Gender Champions Disarmament Impact Group together with the Gender & Mine Action Programme (GMAP) convened a side event at the 17th Meeting of States Parties to the Anti-Personnel Mine Ban Convention (APMBC) on 27 November 2018 at the Palais des Nations in Geneva. At the side event, a factsheet on ‘Gender and the Anti-Personnel Mine Ban Convention’ produced by GMAP and the Impact Group was distributed to participants. The factsheet provided data on the impact of explosive hazards and identified entry-points for gender mainstreaming in mine action, in line with the APMBC and the Maputo Action Plan. Mine action organisations should ensure that systems are in place to safeguard staff and beneficiaries against harassment and to prevent sexual exploitation and abuse. This includes the creation of appropriate reporting mechanisms and investigation procedures. Dr Renata H. Dalaqua, Researcher at UNIDIR provided an overview of the importance of gender-responsive disarmament, and reflected on how gender-sensitive mine action can contribute to the broader realisation of gender equality. Dr Dalaqua provided examples of gender responsive actions that have made mine action more effective in three areas: data collection, mine risk education and mine clearance. There was an engaging questions and answers segment, chaired by Collin O’Brien Namalambo, disarmament expert at the Permanent Mission of Namibia to the United Nations in Geneva. Finally, Ambassador Hans Brattskar, Permanent Representative of Norway to the United Nations in Geneva, delivered the final presentation. As incumbent President of the APMBC Review Conference in 2019, he reaffirmed his intention to use the Review Conference as a platform to strengthen gender equality across all aspects of the Convention. On 15 October 2018, the International Gender Champions Disarmament Impact Group led by Ireland, Namibia and UNIDIR, hosted a side event at the United Nations First Committee in New York entitled Securing our common future: Promoting gender-responsive disarmament and security. The side event provided UN Member States, civil society and other stakeholders with the opportunity to engage on the UN Secretary-General’s Agenda for Disarmament, in particular on the Agenda’s call for the “equal, full and effective participation of women in all decision-making processes related to disarmament”. The event was moderated by Ambassador Michael Gaffey, Permanent Representative of Ireland to the United Nations in Geneva, and Renata Dwan, Director of UNIDIR. Over 150 participants attended the event, illustrative of great interest in the issue and the #DisarmamentImpactGroup initiative. Izumi Nakamitsu, Under-Secretary-General of the United Nations and High Representative for Disarmament Affairs delivered a keynote speech, highlighting the importance of raising awareness on the gendered impacts of weapons. She stressed that the consideration of gender perspectives will benefit disarmament as a whole. She also reminded participants that women remain chronically underrepresented in disarmament fora, and called for the implementation with full rigor of the gender provisions in the UN Secretary-General’s Agenda for Disarmament. Päivi Kannisto, Chief of Peace and Security at UN Women spoke of the differential impact of small arms and light weapons on women, men, girls and boys, and drew on experiences from South Sudan to highlight primary and secondary gendered impacts, including violence, loss of income, impoverishment and discrimination. She also highlighted that aid to conflict areas sees insufficient funding being targeted to address gender issues, and urged a review of funding priorities. Ambassador Pennelope Beckles, Permanent Representative of Trinidad and Tobago illustrated the experiences of CARICOM States, where the gendered impacts of the illicit trafficking of small arms and light weapons are evident. Ambassador Beckles also highlighted the importance of civil society in promoting women’s social, political and economic empowerment, including their important role in realising progress in disarmament. Linda Scott, Deputy Permanent Representative of Namibia spoke of the important role that Namibia played in the adoption of UNSCR 1325. She called on States to implement national action plans on UNSCR 1325, for example by providing services for women affected by gender based violence related to the use of small arms. She highlighted that education on good governance, conflict resolution, mediation and disarmament is essential for ensuring peace and security. Mavic Cabrera Balleza, CEO of the Global Network of Women Peacebuilders spoke of the importance of cooperation among States and civil society, to make disarmament more gender sensitive. She highlighted that lessons can be learned from gender mainstreaming in other policy areas, including from efforts toward the sustainable development goals. She also highlighted that the Arms Trade Treaty is one disarmament fora in which States have the opportunity to make immediate, substantive progress on gender equality. Following the panel presentation, an active discussion took place among representatives of Member States and civil society, including on the factors impacting women’s participation in disarmament; the links that can be drawn between disarmament and human rights fora; and the UN’s renewed efforts to realising gender parity in its fora and various initiatives, including the Agenda for Disarmament. Overall, the wide and active participation at this event demonstrated the growing momentum for mainstreaming gender perspectives in disarmament fora, and paved the way for future work in this area. The International Gender Champions Disarmament Impact Group (henceforth, “the Impact Group”) is a leadership network based in Geneva, co-chaired by the Ambassador of Ireland, the Ambassador of Namibia and the Director of the United Nations Institute for Disarmament Research (UNIDIR). The Impact Group is open to Member States representatives and other disarmament stakeholders, and seeks to promote dialogue, shared knowledge and the pursuit of concrete opportunities to advance gender-responsive action within disarmament processes. support practical engagement and action in disarmament forums. The Impact Group is committed to identifying a handful of events in the annual disarmament calendar that are relevant for substantive work on issues of gender equality, and to engaging in specific actions that can inform and support the shaping of States’ substantive work in this regard. Participants at the Working Lunch confirmed that there are many disarmament fora in which the disarmament community perceives the potential for strengthening the integration of gender perspectives, and for achieving greater gender equality overall. Based on this feedback, the Impact Group co-chairs have identified the following fora for engagement in the period 2018-2019. As a first step, the Impact Group will organise a side event at the UNGA73 First Committee on Disarmament and International Security, on 15 October 2018 from 13h15 to 14h30 in Conference Room 4 at the United Nations. The event will feature the UN High Representative for Disarmament Affairs, Izumi Nakamitsu, and aims to: 1) engage current and potential gender champions on the UN Secretary-General’s Disarmament Agenda; 2) stimulate discussion on and propose concrete measures to achieve the Agenda’s call for the “equal, full and effective participation of women in all decision-making processes related to disarmament”; and 3) provide the space to advance substantive consideration of gender perspectives in disarmament and security fora. The Working Lunch participants raised the Nuclear Non-Proliferation Treaty as an important disarmament forum for engagement, not least because research has demonstrated the gendered impact of a nuclear weapon detonation, and the differential impact of ionizing radiation on men and women. The Arms Trade Treaty was highlighted by Working Lunch participants as the first international disarmament treaty to recognise and seek to address the overwhelming contribution of the illicit flow of arms to gender based violence. The Anti-Personnel Landmines Convention (Ottawa Convention) was also proposed for priority engagement by the Impact Group at the Working Lunch. The next Review Conference of the Ottawa Convention is expected to lead to a 5-year action plan. Norway, as the President of the Conference in 2019, has expressed the will to ensure that the action plan will place a central importance on measuring progress towards gender equality and substantive gender issues under the Convention. In preparation for the selected multilateral disarmament events, the Impact Group plans to convene a “gender briefing” meeting, where it will provide Member States with information on and analyses of the relevant substantive gender issues, inviting external experts and compiling gender-disaggregated data and resources. These expert briefings will serve as an opportunity to map, identify and explore options for coordinated action by States to bring relevant gender perspectives and actions into the relevant issue or framework. In addition to these gender briefings, the following actions were among those identified by participants at the Working Lunch as being possible entry points for engagement by the Impact Group. One category for action that was identified during the Working Lunch was for the Impact Group to support the disarmament community to engage with key actors in multilateral bodies and treaty review processes. For example, the presidents/chairs of these bodies could be engaged to include a gender transformative agenda item within their forum or process; or asked to incorporate a call for gender-balanced delegations and gender analyses of substantive work in their official communication. Working Lunch participants perceive there to be a lack of research resources regarding the gender dimensions of non-proliferation, arms control and disarmament processes. Some weapons regimes (e.g. on chemical and biological weapons) have seldom been examined from this perspective, and other disarmament processes that have incorporated a gender dimension to their work could better communicate their successful approaches. To support positive change in this regard, the Working Lunch identified that the Impact Group could conduct research on the gender dimensions of specific weapons systems, and on women’s participation in disarmament fora; could compose and distribute booklets and audiovisual material that presents concrete examples where gender lenses were successfully applied in disarmament; and could compile and distribute tailored briefing packages ahead of disarmament conferences, geared toward the inclusion of gender-sensitive and transformative language in national statements and multilateral outcomes. At the Working Lunch, it was identified by participants that the disarmament community could benefit from greater integration with programmes and agendas pushing for gender equality in international fora. 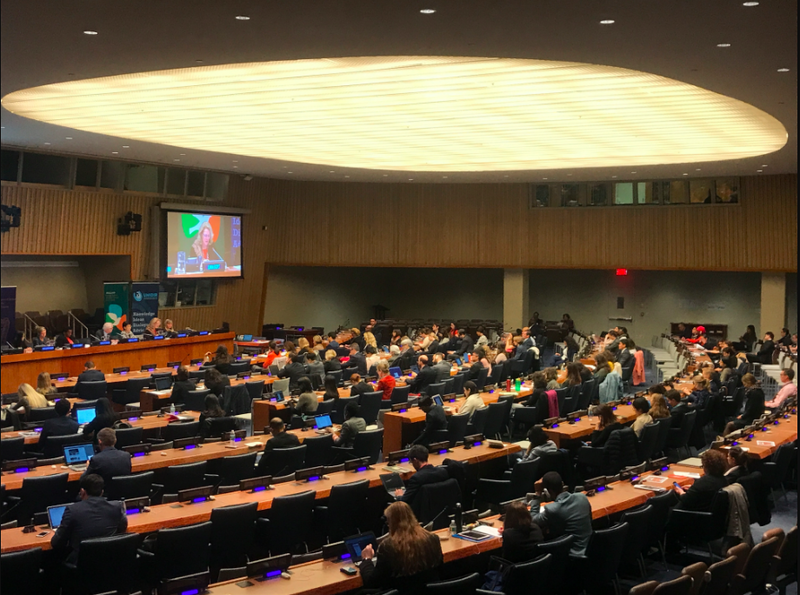 The Impact Group could identify entry points to connect disarmament with ongoing multilateral processes intended to advance gender equality, such as the Sustainable Development Goals. This could be done through thematic partnerships with other UN agencies and joint activities.